Tornadoes, cyclones, tsunamis… Weather can be deadly – especially when it strikes without warning. Millions of Americans could soon find themselves at the mercy of violent weather if the public data behind lifesaving storm alerts gets privatized for personal gain. In his first Audible Original feature, New York Times best-selling author and journalist Michael Lewis delivers hard-hitting research on not-so-random weather data – and how Washington plans to release it. He also digs deep into the lives of two scientists who revolutionized climate predictions, bringing warning systems to previously unimaginable levels of accuracy. One is Kathy Sullivan, a gifted scientist among the first women in space; the other, D.J. Patil, is a trickster-turned-mathematician and a political adviser. Most urgently, Lewis’s narrative reveals the potential cost of putting a price tag on information with the potential to save lives, raising questions about balancing public service with profits in an ethically-ambiguous atmosphere. A best-selling and critically acclaimed author, Michael Lewis is also the narrator of his Audible Originals for Audible Studios. Lewis is renowned for disrupting industries and exposing systemic injustices by probing the lives of individual people in his previous works. Want the lowdown on the financial system? Understand the industry through the moves of one shark finessing it in Lewis’s nonfiction classic The Big Short. Yearn to learn how baseball really works? Feast your ears on Moneyball, and listen to the men who uncovered the hidden numbers game within the game. Tough issues of race and class become relatable in The Blind Side as Lewis tells the true story of a black high school student living with an evangelical family. 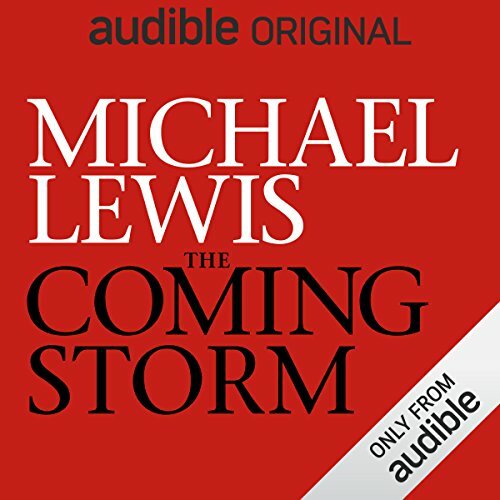 In The Coming Storm, one of four audio originals exclusive to Audible, Lewis focuses his unique brand of nuanced reportage on the implications of state-of-the-art weather data. ©2018 Michael Lewis (P)2018 Audible Originals, LLC. 53 sur 60 personne(s) ont trouvé cet avis utile. 188 sur 228 personne(s) ont trouvé cet avis utile. 87 sur 107 personne(s) ont trouvé cet avis utile.